Go to What is WLTP? The European Union has developed a new test called the Worldwide Harmonised Light Vehicle Test Procedure (WLTP) which came into effect on 1st September 2017 for new type approvals and 1 September 2018 for all vehicles. This will replace the current New European Driving Cycle (NEDC) test procedure for establishing the official Fuel Consumption and CO2 emissions of new cars. 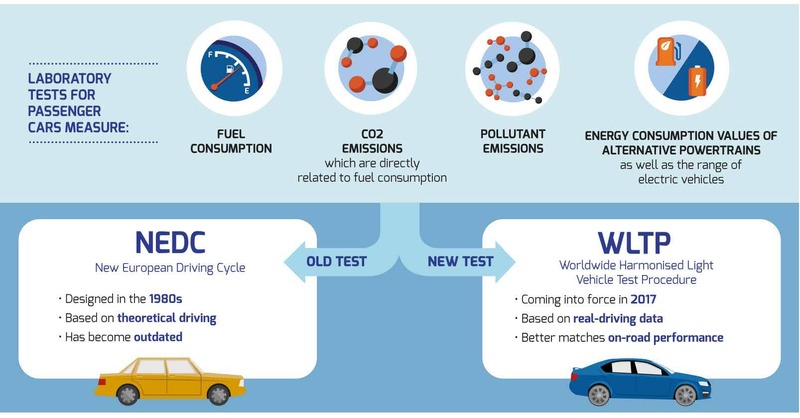 The new WLTP laboratory test will also be supplemented by an emissions test that measures pollutants directly on the road: RDE (Real Driving Emissions) and was brought in to the new testing regime to provide a closer representation of ‘real-world’ fuel consumption and CO2 figures and provide model specific values at the point of sale. This takes place on real roads, the RDE test compliments lab tests by measuring that a car delivers low pollutant emissions on the road. Real driving emission (RDE) tests will measure the pollutants, such as NOx, emitted by cars while driven on the road. RDE will not replace laboratory tests, such as the current NEDC and the future WLTP but it will be additional to them. Europe will be the first region in the world to introduce such on-the-road testing, marking a major leap in the testing of car emissions. WLTP will facilitate a better means of assessing how high the fuel consumption and CO2 emissions of the vehicle may be on average. At the same time, however, more realistic values will also mean higher consumption and CO2 values for vehicles with combustion engines and a lower electric range for electric vehicles (including plug-in hybrids). These new tests will not have any effect or change the performance of the vehicle. From September 2017, all new model introductions will be subject to WLTP type approval and Real Driving Emissions (RDE) testing. From September 2018, all new registrations will need to comply to WLTP type approval. From September 2018, all new Light Commercial vehicle model introductions will be subject to WLTP type approval and Real Driving Emissions (RDE) testing. From September 2019, all new registrations of Light Commercial Vehicles will need to comply to type approval under WLTP and all new registrations will be subject to RDE testing. Toyota Unveils Bold New Environmental Targets With the aim of contributing to global environmental sustainability, Toyota has developed an ambitious set of goals to be achieved over the next 35 years. End of Life Vehicles A list of contacts and authorised treatment facilities for end of life vehicles that are available nationwide.